Boxcutter has received an update as part of our continuation of the 2.79 series. It is with great pleasure that I release Boxcutter 688: GhostScythe. There were quite a few new additions and refinements to classic ones. Even with 2.8 on the horizon it is our goal to continue as normal until the future of Blender is ready and stable. With modifiers present we are on our way but there are still some missing items. Without further ado let’s begin. The top file on the market is the latest. The top file is always the latest. The files below are always legacy support going back a couple of versions. It is also worth noting that Buildbot appears to no longer have Carve present as a boolean solution. As a result the hard mode Bmesh may be the only algorithm going forward. But Carve will be missed. RedFrost has been a new member of the team this release. AR continues to be the shadow boxmaster enigma. RF is special because he does my ideas even if they make no sense. AR is special because he’ll make an idea make sense and take it so far I don’t even recognize the core. Hard Ops / Boxcutter is nothing without the team so rest assured they were compensated for their efforts and continued contributions. While drawing a box if you hold shift the box will be kept live. This is essential for situations where you want to cut but decide mid cut you want to keep it live. Try it out! Hold shift while drawing a red box. It will remain live, allowing you to edit it after the fact. This was a big feature addition and one that really adds to the BC experience. 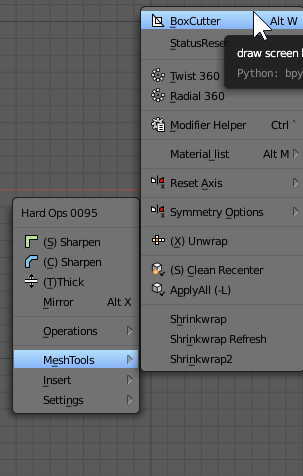 With multiple objects selected you can now cut them with Boxcutter. Now Boxcutter can live up to its name and Slice and Dice with multiple objects. Now edit mode supports all cutters instead of just blue. In edit mode if you press X , Z or A the type of box will be changed. This is another feature I am very excited about and am happy to announce is a part of Boxcutter. So cut anytime… anyplace. While drawing a circle the center can be toggled to spawn at the 3d cursor with D.
This is useful for times where the circle has to be in the perfect center with 3d cursor precision. This feature was a personal long time request of mine and am glad to finally have it in Boxcutter. Too long have we been restrained by the 3d cursor when cutting to depth. How would you like a constant depth? Cut depth is in the D menu and will allow you to use the 3d cursor differently than before. In the old version cutting to depth was done by using the cursor as the depth indication. The previous mode is still viable and usable however cut depth changes the approach a bit. The goal was constant cutting without realigning the 3d cursor. Thanks to CGcookie our help system has improved. As a fan of retopo I always had my eye on their help and wanted to try something dynamic with it in BC. Right clicking the help box closes it. The help box is also a good indicator of BC being activated. RMB was used to prevent from accidentally moving the 3d cursor. This might be toggle-able in the next version. You are also able to fine tune the corner and padding. *some users have been reporting issues with this so a bugfixed has been pushed as the file at the top Boxcutter 0688 (zip). So this should be resolved. Being able to toggle snapping without the D menu was an objective for touchscreens. Right clicking the BC logo will turn it red. When the logo is red snapping is enabled. Hopefully in the future it will expand to cycle between grid and custom snapping but this was a final touch that was requested. There is a pref that will make boxcutter jump into orthographic while cutting. This is useful for situations where numpads aren’t available and perspective cutting is not desired. Notice that for every cut the view is jumped into ortho. Making it much more predictable. This drove me crazy when using Boxcutter on a laptop. Boxcutter now has a hotkey tab. In addition to hotkeys there are also UI prefs for color coding your cutting workflow. This has become a common trend with our tools. Also you can set a color for any alternate shape. The defaults are as follows. Alt + W starts Boxcutter. However now it loads up in the correct 3d view. alt + ctrl + Q – quad view. I updated to this version today, but I don’t see the help button in the bottom right corner. And I didn’t touch any option. It’s unfortunate because I need it. Also right-clicking the icon does nothing. Finally what’s the difference between “draw screen buttons”, and “enable/disable bc” they do almost the same for me, except one needs escape to leave BC. redownload it. There was a small bug that has been resolved. Now it should behave properly. It’s working as expected, thanks! I’ll let you know if I notice anything else. excellent. We’ll update the help with these notes! The vigilance of the users help make these products great. – in my previous comment I said to replace “MMB” with “wheel”. But not for “Orient view” because I just learned today that you meant “Align view to face”, and shift + alt + MMB on a face does work!! So perhaps change the explanation text a bit to better reflect that. Blue border and Help it’s not drawing in the 3d view. Lots of errors in the System Console. there might have been a glitch. Try the latest zip that has been uploaded this morning. It should resolve this. we’ll check into this but V3 should have fixed this. ill check into this and see what is causing this. You’re the first to report this issue. Are you using a particular blender build or buildbot? I have just downloaded this addon and using it for the first time along with hardOps. I can’t get the mirror mode to work, there is no access to it through pie menu or through tools, not even a single ghostly presence of this mode. What am I doing wrong? Pie menu is D. When boxcutter mode is active which is the alt + W shortcut. You know youre in BC when the border is on screen. During draw 1, 2, or 3 would toggle mirroring as well. PS. Hard Ops also has a boxcutter option for assistance. Here are the screenshots, one is from one of your tutorials, another one is mine. I don’t get the mirror options in the pie menu. Also I tried to press 1, 2 and 3 while holding Ctrl +LMB to draw a square and it didn’t toggle the mirror mode. youre using a very old version of boxcutter. Get the latest zip from the product page of whichever market you used. Update blender from here. 2.79b is still too old. Boxcutter 7 is for 2.8 you will need to download the proper zip. so we need to wait for better selection methods ? (like ngon in the previous version) ? btw… You are releasing new versions for free ? when someone bought the boxcutter once ? or how that works ?